Home Page | Uncategorized | Why you don’t want to interchange Instument and Speaker cables! Why you don’t want to interchange Instument and Speaker cables! Last week I walked into a friends jam session to hang out and listen. He was showing me his boutique amplifier and some of his guitars. When he plugged his guitar in there was a terrible buzz & hum coming from his rig! We were both caught by surprise and immediately started started troubleshooting some of the common causes, such as bad connector or an A/C power source radiating too much EMI near by. I unscrewed one of the 1/4″ connectors on his “guitar”cable to see if we had a loose solder joint but instead found he was using a speaker cable. 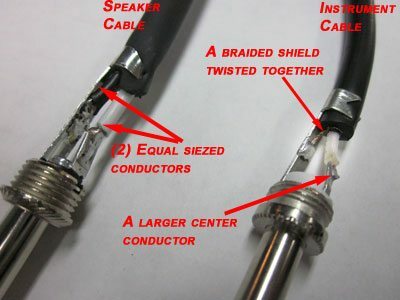 Unscrewing the 1/4″ barrel relieved a twisted pair of conductors with no shield (typical of a speaker cable), rather than once center conductor and shield you’d find on an instrument/ Guitar cable. We quickly swapped out the cable with a proper instrument cable, and walla, beautiful tone with no noise! This incident let me to think, using the proper type of 1/4” cable whether it be for an instrument or speaker run is incredibly important and often doesn’t get the weight and attention it deserves while troubleshooting problems. In this blog we’ll discuss why you should only use a speaker cable between the power amp and a speaker and instrument cable for instruments. You shouldn’t plug your instrument/guitar into it’s amp using a speaker cable because guitars, specifically passive guitars, send out a very low level signal. This low level signal is very susceptible to noise induced from RFI/EMI from cell phone and radio towers, dimmers and florescent lights, electrical transformers, and other sources that are always around you. The shield around an instrument cable keeps most of these interferences from getting into your guitar signal. Because a speaker cable doesn’t have this shield, if you use it to plug your guitar in, you’ll generally get a lot of noise in the signal due to induced interference. You’re not going to hurt anything by using a speaker cable as an instrument cable, but you’re likely not going to get a noise free sound either. You shouldn’t plug your speakers into your amplifier using an instrument cable because instrument cables don’t have low enough resistance to let speaker level voltages flow with ease. Essentially the amp would be trying to send all of its power down a small center conductor and a thin braided or foil shield! At low volumes you’ll likely not have any problems, but in the event you have a powerful amp and turn the volume up, you’ll likely hear slight distortion of the signal, the amp will have to work much harder and have less power to drive the speaker, and in some cases, could even start heating up the instrument cable to the point that it melts the jacket and creates an electrical short circuit! This could of course ruin your amplifier and/or your loudspeaker. I hope this post was able to shed a little light onto what whats going on below the outside jackets of two very similar looking cables. If you have any further questions or comments on this topic, or have another issue you’d like to see us cover, please leave us a comment below!